Your contact center. Anytime. Anywhere. With an estimated 60% of contact centers utilizing virtual agents in some capacity, employing remote agents is fast becoming the new standard. Enable your business to easily set-up remote agents in any location, reduce costs, and enhance productivity without sacrificing quality using 3CLogic’s complete contact center solutions. Get your agents online, and your contact center in business. 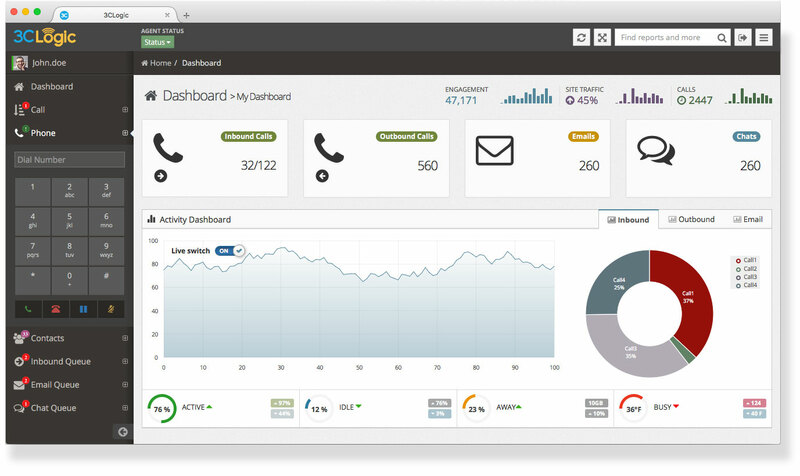 As a cloud solution, 3CLogic’s Virtual Contact Center platform removes the hassle of maintaining expensive and outdated on-premise telephony equipment, giving users the ability to access their contact center operations from any location with Internet, a desktop or PC, and a headset—it’s that simple. Using 3CLogic’s cloud-based Interactive Voice Response (IVR), Automatic Call Distribution (ACD), and skills-based routing tools, mold your telephony platform to preexisting business workflows and automatically route customers to the agent best fit to meet their needs, no matter the employee’s location. To measure the overall success of your remote employees, 3CLogic’s advanced Athena reporting engine enables supervisors to quickly create customized reports, graphs and KPIs based on their day-to-day activities with a simple click-drag-and drop, giving your contact center the insights it needs to keep performance on track.